There’s no denying it, holiday festivities hog the spotlight during the early winter months. But when the decorations come down and the kids head back to school, inspiration for fun family to-dos becomes more difficult to find as the winter grinds on. If your family’s caught a case of the winter weather woes, then we’ve got just the thing to chase those cold weather blues away. Our list of 7 dynamite, budget-friendly (and actually cool) family activities has a little bit of something for everyone. From seasonal events, like playing ice hockey on the pond to cozy-up-next-to-the-fire ideas like a Chick-fil-A kid’s meal-inspired read-a-thon (we’re not kidding!). So get the family together and start planning. A winter’s-worth of fun awaits. Check out the list below and let us know which activity your family enjoys most! Okay, okay. We’re kicking off the list not only with a quote from Frozen, but with one of the most classic activities winter can offer. But before you skip to number 2, wait for our special twist: Find a way to build unexpected ingredients into your creation. Instead of a carrot nose, use a leftover candy cane. 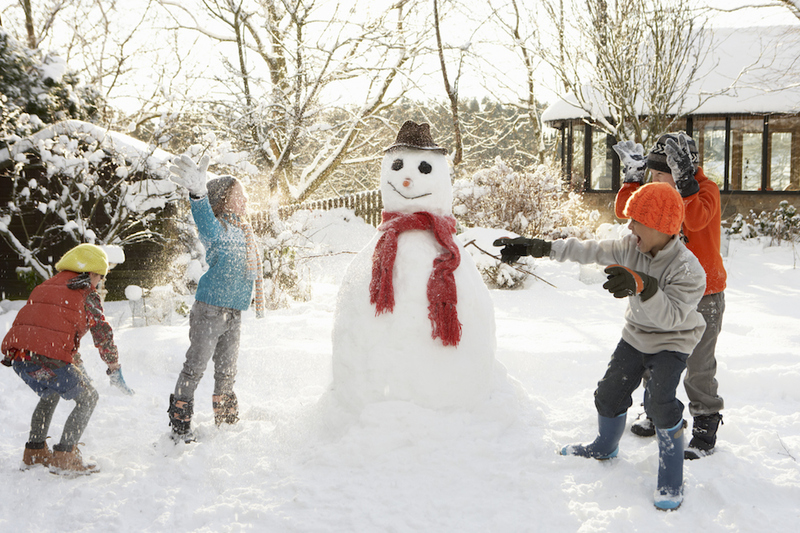 Instead of a snowman, build a “snowrabbit” or another animal of choice. Don’t forget to name it! Create a new family tradition by breaking from the norm…let’s see how creative you can get. Gather all the blankets, sleeping bags, pillows and sheets you can find to make a giant, family-sized fort. Drape your blankets over chairs, tables, coat racks and more to create a structure that could rival the Perkins’s tent (from Harry Potter). As a last step, lay the sleeping bags and pillows down on the floor, but don’t get ready for bed just yet! Go all out by making s’mores over the stove and telling ghost stories by the fireplace…if you dare! Now’s the time to put all those holiday gifts to good use: Bring out the games and movies – new and old ­– and prepare for a night of multimedia entertainment. Perhaps you learn a new game together as a family and then settle in for a fireside flick (Don’t forget the stove-popped popcorn with extra butter!) If your family craves a little extra competition, raise the stakes by letting the game-winner choose the movie. 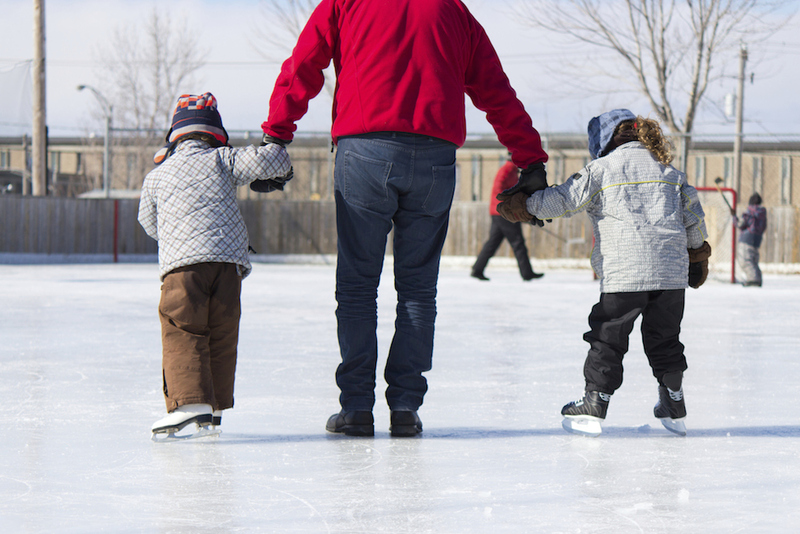 Dust off those skates and suit up for an afternoon of ice-skating and pond hockey. No access to a pond? No problem. Seek out a local ice rink with public skate and open hockey times (these venues often have a skate rental option available as well). When the day is done, warm up with steaming cups of hot cocoa with extra marshmallows on top. If your family watches the big game from the living room rather than the stadium, you can still bring the game-time excitement home with a good old-fashioned Southern tailgate. Get the family all gussied up, start prepping the barbecue (have someone man the corn bread and coleslaw while you take care of the pulled pork. #teamwork). If you’re really getting into it, invite the neighbors over for a Sunday shindig that both families won’t soon forget. We can’t help but suggest one activity that’s as fun as it is educational. Mom, dad, take a night off from cooking, load up the car and swing by your local Chick-fil-A to pick up some finger-lickin’-good food including kid’s meals that come complete with interactive prizes that stimulate young minds while encouraging families to create meaningful fun together. Great examples are our PocketDoodles and 3-D poster series with Kennedy Space Center, featuring awesome adventures to Mars and deep space! Read the cool facts aloud together as a family, while finishing off the last of your tasty Chick-fil-A treats. But remember…don’t talk with a full mouth! “Playing house” is so 2014. 2015 sets the stage for a different game to play. As a team, brainstorm the name of your brand new family restaurant. Assign the tasks of creating an official sign, writing up the menu and setting the table. Get into character by dressing up in chefs hats and aprons. If you’re still hungry when dinner’s over, dive in to a vanilla sundae bar for dessert. Go ahead and get a little crazy with the toppings. There’s no such thing as too much whipped cream, right?